DUBAI– 25th November 2010 – Emirates, the Dubai-based international carrier and JetBlue Airways have announced the launch of an interline agreement that offers travellers seamless connections to cities across the United States via New York’s John F. Kennedy (JFK) International Airport. Under the new agreement, customers can purchase joint Emirates-JetBlue itineraries by calling their local reservations office or booking through www.emirates.com, meaning that dozens of U.S. cities, including Boston, Chicago, Orlando and Washington are now just a smooth connection away. Customers will be issued with a single combined ticket for Emirates and Jet Blue-operated flights and enjoy one-stop check-in and baggage transfer between the airlines. Emirates is one the world’s largest international carriers, flying to 108 cities around the world with a fleet of wide-bodied aircraft equipped with industry-leading comforts in the air. JetBlue is the leading airline at JFK Airport, where it offers premium low-fare service to dozens of cities throughout the Americas and carries more travellers than any other airline. 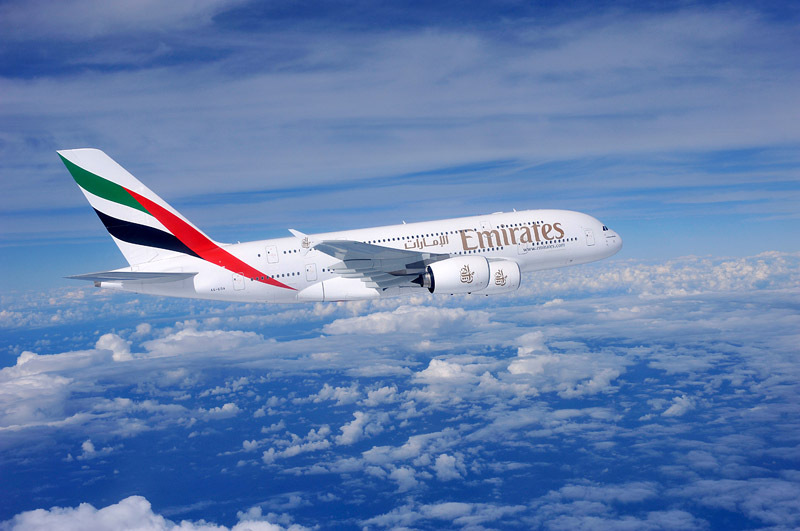 Emirates currently offers two daily nonstop flights to JFK – including service aboard its flagship A380 and its ultra long range 777-300ER – both of which offer travellers fine dining, personalized service and multi award-winning entertainment options. Known for its award-winning customer service, JetBlue will offer transfer customers from the U.A.E. and Emirates’ network of global destinations a premium experience that includes all-leather seating, unlimited free snacks and drinks, plus the most legroom in economy class (based on average fleet-wide seat pitch) and the most free live entertainment of any U.S. airline. JetBlue operates one of America’s youngest airline fleets, with 157 Airbus and EMBRAER aircraft. At JFK Airport, JetBlue operates from its acclaimed new 26-gate Terminal 5, while Emirates operates from the adjacent Terminal 4, allowing for fast and easy connections between flights. Photo captions: 1. An Emirates A380 aircraft. Award-winning Emirates is one of the world’s leading airlines. With its quickly expanding fleet of 152 wide-body aircraft, Emirates flies to 108 destinations in 65 countries in Europe, North and South America, the Middle East, Africa, the Indian subcontinent and the Asia-Pacific region. In the United States, Emirates offers double daily services to Dubai and beyond from Houston, Los Angeles and New York, plus daily flights from San Francisco. With 14 A380 aircraft in service and 76 on order, the airline is the largest A380 operator in the world and flies the superjumbo from Dubai to New York as well as to Auckland, Bangkok, Beijing, Jeddah, London Heathrow, Manchester, Paris, Seoul, Sydney, and Toronto. For information or reservations call +1 800 777 3999 from the U.S.A., +971 4 214 4444 from the U.A.E., TTY/TDD +1 888 320 1576, or visit www.emirates.com/usa.